Most deliveries are done with a full size truck and a 20′ trailer. 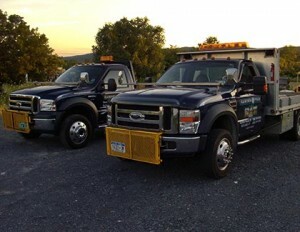 Our drivers will always assess your site to decide on the best way to access it. 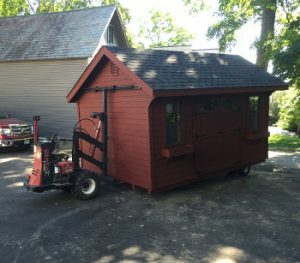 Typically we will back onto your carefully prepared site and slide the shed off the rear of the trailer. Once your building has been unloaded, our driver will be sure the shed is situated properly on your pad, making sure all doors and windows work properly. If you are not planning on being home for delivery, please be sure to mark where your building will go with the provided flags. Final payment is due on or before delivery. We expect to complete all regular free deliveries within 45 minutes. In the event of squishy, muddy conditions, you may wish to reschedule delivery to prevent our truck getting stuck, or creating ruts in your yard. Our delivery team requires 14′ high clearance to access your site. Please consider any existing overhangs, overhead branches & wires within the path the delivery truck will take. Be sure all obstacles are removed before we arrive. Make sure the ground is firm enough to support our delivery vehicle. Please consider a location free of rock, ledge, stumps, large roots, wires and pipes. Advise Garden Time as to where you would like us to place any excavated material. If you have any concerns about accessibility, please contact one of our sales staff to Schedule A Free Site Check! If your site has limited access, additional equipment may be required at an additional cost. Kits are also available with many of our buildings. The mule makes limited site access installation a breeze. Rates start at $150. We offer FREE DELIVERY on orders over $1,500 within 50 miles of any of our four sales locations! If you are further than 50 miles, the first 50 miles is free and a charge of $5 per mile one-way is charged for every additional mile. If your order is under $1,500 we charge a fee of $75 within 10 miles of our locations plus $5 per loaded mile beyond 10 miles.